It wouldn’t be Christmas without a viewing of my favorite childhood holiday movie- National Lampoon’s Christmas Vacation. I can think of no other film that totally captures the joy and the stress of family holiday get-togethers quite like this movie. National Lampoon movies have always been pretty low-brow, but out of all of them I think Christmas Vacation is by far the best. 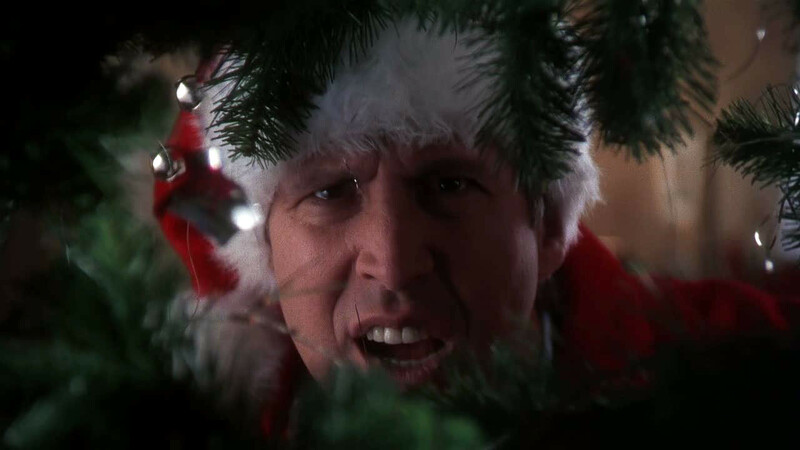 Chevy Chase as Clark W. Griswold is the everyman in all of us- the person who has such high hopes for a wonderful, sentimental holiday surrounded by friends and family and hot cocoa, only to see those hopes dashed by uninvited guests, financial woes, and tangled piles of non-working Christmas lights. He tries so hard to make it all perfect, not realizing that a perfect holiday is impossible when in-laws are involved. Christmas Vacation was always an annual movie in my house, along with A Christmas Story. In fact, I liked Christmas Vacation so much that I can remember watching it several times during July! We didn’t have huge holiday gatherings like the one in this movie, but there were still a lot of things that rang true for me. Just the opening scene of a station wagon traveling on a dirty, slushy, salt-covered highway is enough to make me shudder in memory of my childhood in western Pennsylvania, where the winter weather never fluctuates much from “grey”. Then there’s the bickering amongst siblings, the grandparents stressing out the parents, overheated department stores, and hours spent checking twinkle light strands for the ONE bulb that isn’t working. When Clark fantasizes about an afternoon by the pool as Hawaiian Christmas music plays in the background, I think we can all relate to that need to escape by the time Dec. 25th rolls around. For my pairing this week, I decided to play on Clark’s fantasy of a sunny Christmas, while mixing in a dash of Cousin Eddie’s preferred beverage- eggnog. I’m not a huge fan of eggnog, but when mixed with enough other things, it becomes tolerable. I particularly like this recipe because it reminds me of a tropical drink- sort of a vacation in a glass. 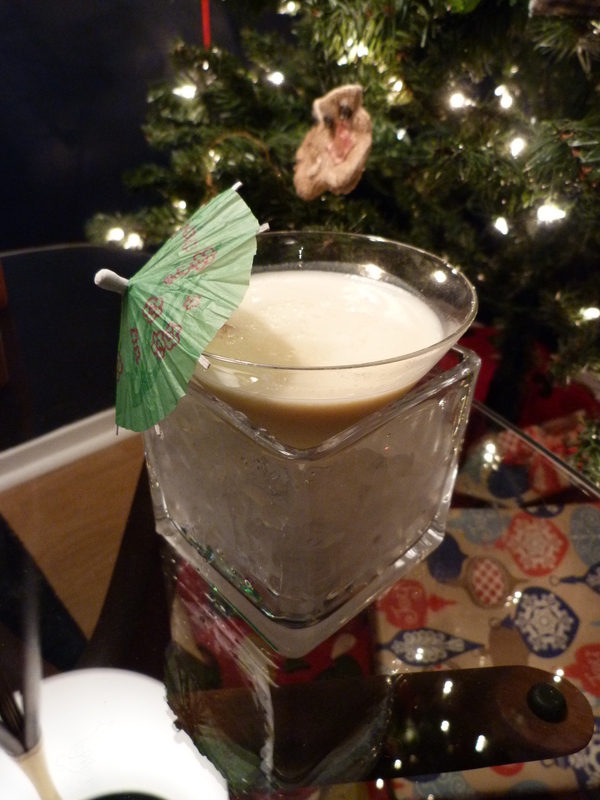 Combine eggnog, pineapple juice and rum in a cocktail shaker over ice. Shake and strain into a chilled martini glass. *Note- If you want to make this for a crowd, these quantities can all be upped pretty easily for punch-bowl serving. Also, if you like coconut, feel free to use Malibu rum for an even more tropical flavor. This Christmas, before you get yourself all stressed out trying to make things perfect, sit back with a glass of this eggnog, watch Christmas Vacation, and remember that things could always be worse. You could have a redneck cousin emptying his RV’s sewage line onto your street, a squirrel loose in your house, a turkey drier than Texas in August, and the SWAT team arriving at your door on Christmas Eve. What this movie shows us is that Christmas is really all about family- the good, the bad, and the Cousin Eddie’s. Cheers! Posted in Holiday Films and tagged Chevy Chase, Christmas Vacation, Eggnog, National Lampoon's. Bookmark the permalink.